A bathroom is supposed to be a sanctuary, but sometimes that seems unattainable	if you are lacking the proper space for you and your family members. Instead	of dealing with the lack of space, hire our Boston bathroom remodeling	team at Martin Kitchen and Bath! 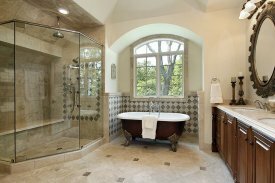 We can work with you to design your perfect	bathroom, and then make it a reality via our remodeling services. We have more than 25 years of kitchen and bathroom remodeling experience	and our team goes above and beyond to ensure each customer is 100% satisfied. Each project we are hired to complete is finished by the deadline we provide,	so you do not have to worry about us being in your home longer than necessary. If you have any questions regarding our services, please	contact us at (617) 847-3053!